Getting Things Done- What’s Next? So, by now you know the importance of having a system to process your thoughts and actions, how to process them, how to record them, and how to keep track of your projects. You can find out more about each of these on David Allen’s website. 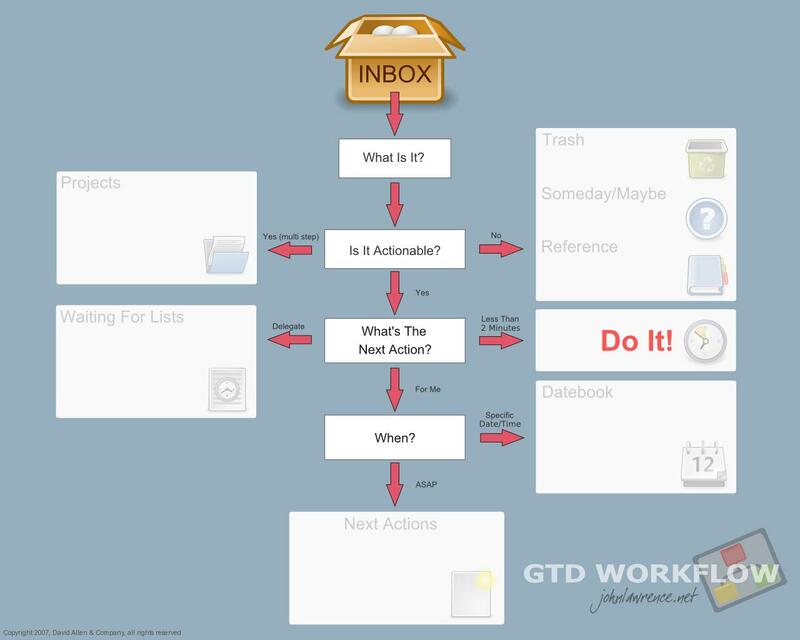 Your GTD System is not something you learn once and use for the rest of your life. Your system will change and evolve as you grow and become better at it. David Allen created the system, and he constantly updates his website with new material on Getting Things Done. Do not forget to look at his book as well, Getting Things Done- The Art of Stress-Free Productivity. If you are new to the GTD system this book provide you with more details that will give you a better understanding of the system. An audio book is available too, if you prefer listening over reading. Personally, I would recommend getting both the book and the audio CD, since both are very different. David goes into more detail in the latter and it feels like you are in a seminar with him. The information that I have provided here about Getting Things Done is just a basic guideline. You do not have to implement everything in the system for it to work, and frankly does not work for everyone. The thing about GTD is that you can use the information to create your own personal system. This why David Allen also does not recommend or endorse any specific tools. You can create your system based solely on a paper notepad, rely on your smartphone or tablet, or use a system based on your computer or laptop. In fact, considering the variety of applications and technology that we have available right now, you could even make a system that works everywhere. Evernote, for instance, is a great tool for maintaining your GTD system across various platforms, including your smartphone, tablet PC, desktop, and laptop. Once again, you should stick to what works best for you. Future posts will look at Evernote in more detail and how it can work with your Getting Things Done System. If you have any questions on implementing your Getting Things Done System or productivity tools in general, comment here or send me a message here and I will be happy to help you in anyway that I can. This Getting Things Done article is one of the most interesting and informative content I have come across. Thank you for the information. I will be waiting for more updates from you. Thanks for your comment and your kind words Tushar. I will try to live up to your expectations.